Where is St Lucia? It lies in the eastern Caribbean about 21 miles (34km) south of Martinique and 26 miles (42 km) northeast of St Vincent. 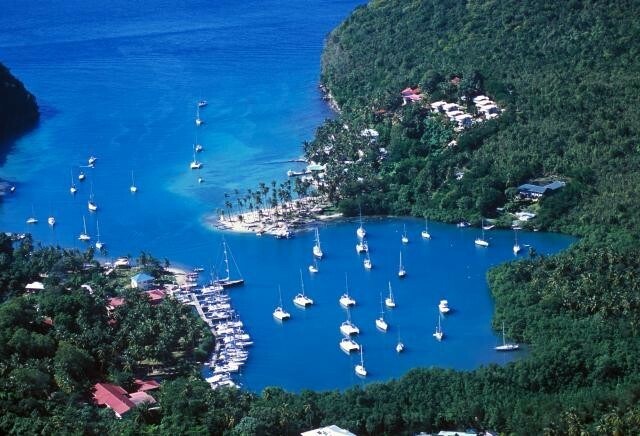 St Lucia is approximately 20 miles long and 10 miles wide. St Lucia is one of the most beautiful islands in the Caribbean and it is also one of the most interesting and breathtaking in terms of its landscape and scenery. It has some of the most beautiful and pristine palm fringed beaches in the Caribbean, together with magnificent rain forests, cascading waterfalls, incredible, rivers, papaya orchards, stunning bird life and tropical gardens which are full of wild orchids and birds of paradise. It is very lush and mountainous and is blessed with the very recognisable and beautiful twin volcanic piton that rise half a mile straight up out of the sea. St Lucia is the perfect place to relax and enjoy the beauty that surrounds you but it is also perfect for those looking to be a bit more active. If you're not sure what to do in St Lucia then check out our activities guide. Activities include plantation tours, nature hiking, horse-riding and bird watching. You will even be able to spot Turtles in season. For water sport enthusiasts, you can enjoy excellent sea water sports in St Lucia such as snorkeling, wind surfing, scuba diving and deep sea fishing. There are several world class golf courses including Sandals Regency course and St Lucia Golf resort and country club. For the shopping enthusiast, St Lucia has the wonderful advantage of having duty free status. Even though St Lucia is one of the most popular islands for discerning tourists, much of the Island remains unspoiled and you will still be able to find deserted white sandy beaches on occasion. All of this together with fabulous weather, world class restaurants and some of the friendliest people in the Caribbean make it simply Paradise. Zoom to view Regions and click marker to view properties. Passports and visas: US Citizens and members of the commonwealth require a valid passport to travel to St Lucia. Citizens of other countries should check with the St Lucian Consulate before travelling. Language : English is the official language of St Lucia although many people speak a French Creole Patois. Driving: St Lucians drive on the left. A visitors driving permit is required which can be obtained from the police station or often from the car hire companies. These figures show St Lucia monthly average maximum temperatures and monthly average rainfall.